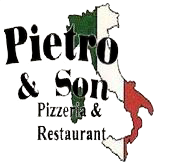 Pietro and Son Italian Restaurant | A Taste of Italy in Elmira, NY! Bleu Cheese or Crumble Bleu Cheese $0.75. Add one meatball or one sausage for $1.50. There is a $2.00 plate charge for any split meals!